But it can't be from Dolly Clackett. She gave me an Easter egg! : You're so nice to me, and I was so mean about your zookeeper dream. You're so nice to me, and I was so mean about your zookeeper dream. Hello folks! I'm coming to you feeling a lot brighter and cheerier than in my last post. I'm not entirely sure why, but I am grateful. Maybe my brain has adjusted to the shift to autumn and the clock change. It's been a few weeks of intense activity. I have been down to London a few times to see friends, done a fair bit of socialising in Leamington and I have even done some of whatever the autumnal equivalent of spring cleaning is. Nic and I spent the weekend before last building Ikea shelves and doing a bit of an overhaul of the furniture and storage in the flat. As a result, I have a whole set of shelves just for shoes and I have more storage for bags and accessories and stuff. Everything just looks a lot neater and prettier. Of course, it means that I have more space for more stuff and I am valiantly trying to resist the urge to BUY ALL THE SHOES. So far I'm not succeeding (I bought some ankle boots today) so it's business as usual, really. I have been doing my best to fit sewing in around everything else, and it hasn't been the easiest as work has been pretty busy as well. However, I found myself with a free evening a few weeks ago as Nic was out at a gig. I had been working from home that day, and the beauty of this is that with no commuting time, I can just switch my computer off at the end of the work day and switch my sewing machine on. Sometimes I am even able to cut fabric out during my lunch break, although I wasn't able to on this particular day. Even so, I had a new dress by bedtime, and what's not fun about that? LOOK AT HOW SASSY SHE IS IN THAT LILAC THING. 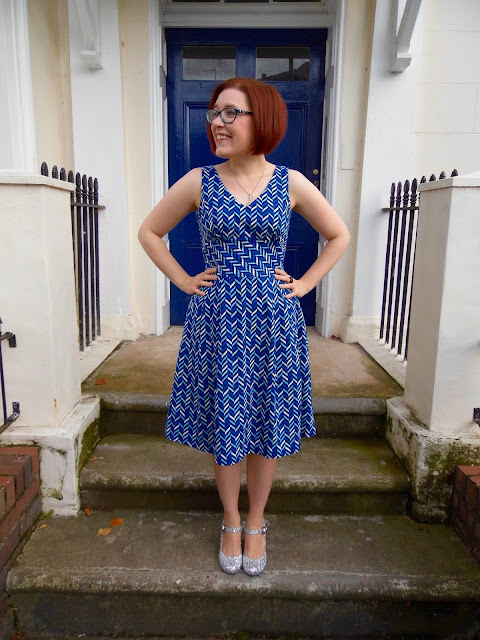 I'm generally a fan of New Look patterns - they're excellent value for money and I have never had any issues with their quality and a lot of their patterns really are very lovely. But MAN, do you have to look past the photography. I'm halfway tempted to actually frame this envelope because her face is cracking me up so much. I think the worst thing is the sash, though, and I think that's what her face is trying to tell us. Why would you do this to someone? Admittedly, I have a prejudice against sashes. THIS IS WHY. I decided to go for view D of the dress but obviously without the sash. I also decided to wing it without sewing a toile. I didn't super love the fabric so I knew that in the unlikely event that it was a total disaster, I wouldn't be completely gutted. I followed the instructions and the order for construction wasn't quite as I would have expected it but it worked out well. I had to do a little bit of unpicking because of the way the bodice is constructed, but even with that it all came together really nicely. There are a couple of things that I really like about this pattern. Although I am not sure about the midriff band on me, I do love the way it's cut on the bias, as it gives you an opportunity to have fun with prints. Here's a weird close-up of my bust and waist so you can see. I think it actually looks cooler from a bit further away, but there you go. 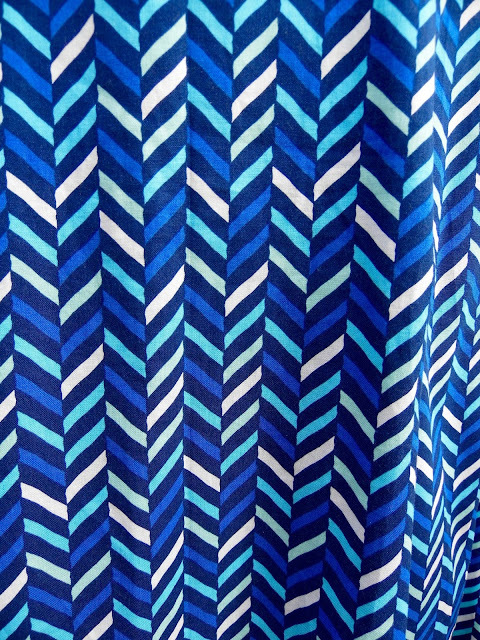 For view D, there is an extra pattern piece for you to cut some interfacing for the v-neck. It keeps it really nice and crisp. It sounds like such an obvious thing to do, but I've never seen it in another sewing pattern and I thought it was such a good idea! I love the skirt, which is a very pretty shape with essentially perfect pleats. 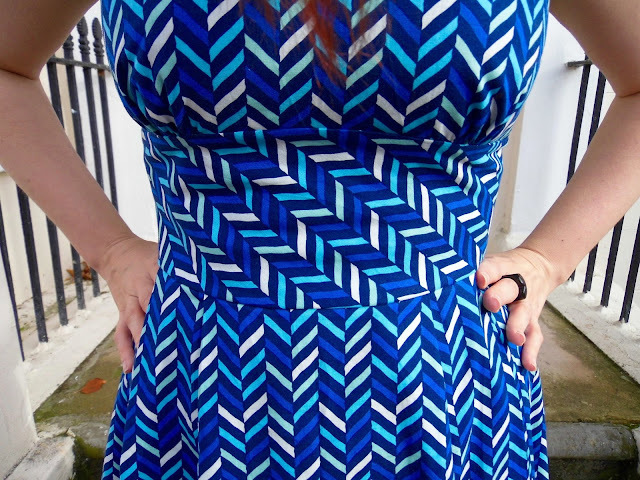 The pattern calls for a lapped zip, which I think is kind of unusual to see in sewing patterns now. I sewed a concealed zip because it's what I felt like doing. I like the way the herringbone design makes pattern matching pointless, but also effortless. Also, my god. No-one should have to see their own back. I look so fat from the back! I didn't make any adjustments to the pattern with the exception of sewing the shoulder straps a bit shorter to accommodate my short torso. Straps constantly sliding down is not the one. I thought I might need to shorten the bodice slightly and I did that on a subsequent iteration of this dress, but I think it might be better as it is. 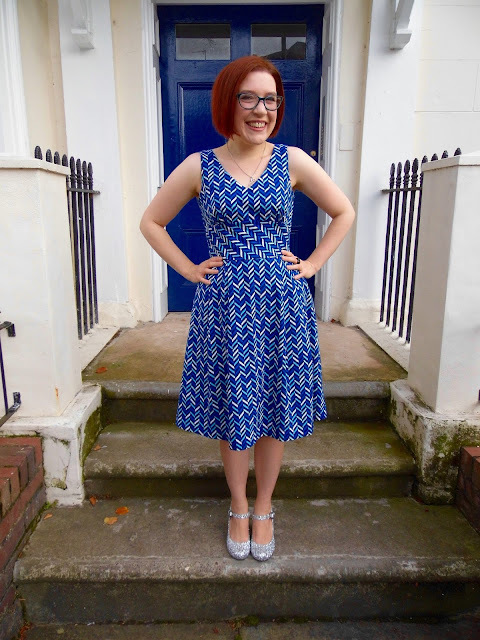 I've worn this dress a few times since I finished it - in fact, I wore it to work today - and I like it a lot. 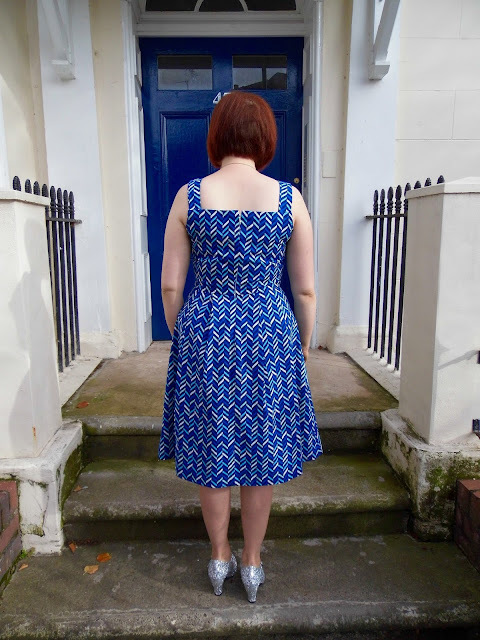 I think I need to tinker with the pattern a bit - it feels like there's a bit more fabric around my stomach than I would like so I might take out a bit of ease there - but on the whole I think this is a winner. I put it on and thought it really looked like a dress you might buy in Monsoon, so I think that's quite a good thing. Not that I'm a massive fan of them (and wouldn't be shopping there anyway given recent news stories) but, you know. I think it looks well-made and professional. 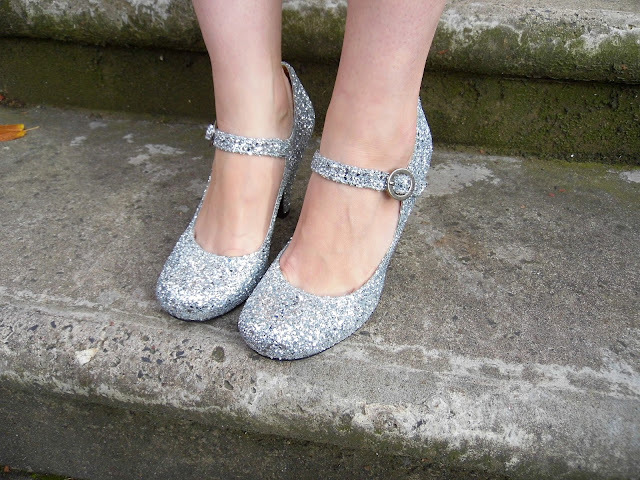 More sparkly shoes and I'm not even sorry. Woo-hoo! I'm still deeply into listening to my Nashville CDs on repeat - Nic would be at the point of banning them, only I think he finds my terrible singing-along too tragic to be that cruel - and I had them cranked up loudly while I was sewing this dress. My current favourite is the duet between Rayna Jaymes and Luke Wheeler - Ball and Chain - hence the name of the dress. I'm off to Glasgow tomorrow for a few days for work, so poor old Nic will get a bit of a break from the Nashville CDs this week! Anyway, that's the craic from me this evening. Nic has just come home and he's looking some attention - talk about a ball and chain (lololololololol) so I'm wheels up and out. See you later!